The Brand Video is typically short, one to two minutes long, and introduces you and your brand to a new Cold Audience. Think of it as meeting someone new at a social event for the first time. You want to engage with your audience without being pushy or trying to sell them anything. The objective of your first video campaign is to position yourself as a ‘solution provider, for a specific problem, for a specific audience.’ Note that I use the word ‘specific’ twice. We should never generalize by trying to provide everything for everyone one. When you try to talk to everyone, you talk to no one. So always be specific regarding your audience and your offer. When you become more specific, you will appeal to fewer people, but the ones that you do attract will be much stronger. That is why it’s vital to create a brand that is distinctive rather than plain. They couldn’t agree on which flavour to buy, so I decided to get Vanilla. Vanilla is neutral; no one hates vanilla, but then again, no one loves it either. It’s just plain. You never want your brand to be just plain. In fact, most of your competitors are vanilla. Pick a flavour that your ideal customer will love and don’t worry if your non-potential customers hate it. The most successful brands both appeal and repel, so follow their lead. The Brand Video campaign is our first encounter with our potential customer.They are unaware of their problem and any potential solutions. 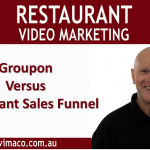 So trying to sell them anything at this stage will not be very effective, and your video ad campaign costs will be high due to a lack of conversions. So if we can’t promote and sell our product in the Brand Video, what do we do? We tell stories that engage with our target audience. You see, our audience’s decision-making is motivated mainly by emotions and our ability to gain their trust. The old adage goes, ‘facts tell, but stories sell.’ Stories appeal to our emotional brain, where the vast majority of our decision-making is done. In other words, we decide using emotion and justify with logic. Successful brands don’t focus on WHAT they do or HOW they do it; those are by-products of WHY they do it. The WHY is your Brand Story. We need to create awareness and start building the foundations of the Know, Like and Trust factor with our audience. We do this by sharing our Brand Story. But don’t worry, you don’t need to hire a Hollywood screenwriter for your blockbuster video. You’ll just be using real events from your own experiences. Sharing your Brand Story is the most effective way to connect with your audience. It is essential that your story relates to your audience. For example, you may have had the same problems as your target audience have now. Your story will resonate with them and show them how you managed to overcome those challenges and reach a position that they would like to achieve too. This is what I call the Hero Story. Obviously, your Hero Story must be authentic and inspire your ideal audience to take action. The concept of the Hero’s Journey was popularised by Joseph Campbell’s The Hero with a Thousand Faces and provides the template of some of the most successful movies of all time. I have adapted his template for our own purposes for the Brand Hero Story. Keep it simple. There is no need to turn your Hero Story into a major epic. Remember your audience doesn’t know you yet, so keep your Hero Story brief and engaging. Some people will relate to your story and become fans, others won’t and will move on, and that’s ok too. You’re not vanilla. You now a flavour.